Checks and Balances - Viva La France! Support Our Revolution! 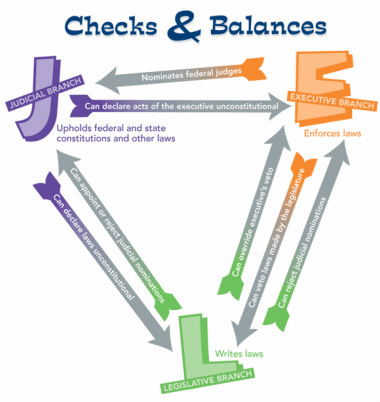 Checks and balances is a system that prevents each of the branches from having too much power. For example, when a law is made, it starts with the Legislative branch that introduces and votes on a bill. Then this bill goes to the Executive branch. This is where the president decides if it is good or bad for the country. If he says yes he signs, and if he says no he vetos it. This is done so that tyranny can't anymore. The Judicial branch can over rule the president's "yes" by declaring something unconstitutional.